Curiosity’s #selfie game is strong. This starting to get out of hand. Weeks after Curiosity detected spikes of methane in the Martian atmosphere, possible evidence of biological activity, a prominent geo-biologist says she sees possible signs of past life in photos of the Martian landscape taken by the rover. Nora Noffke, an associate professor at Old Dominion University, looked at the structures seen in rocks on Mars and compared them to geological structures on Earth that are formed by microbes living in communities called microbial mats. The structures belong to a group of microbial structures that form by the interaction of benthic (living on the ground) microbes with sediment dynamics (erosion) in clastic deposits such as sand. In other words, if such structures do exist on Mars, that suggests the planet may have once harbored microbial life. The microbes would have existed on Mars less than 3.7 billion years ago, according to Noffke. 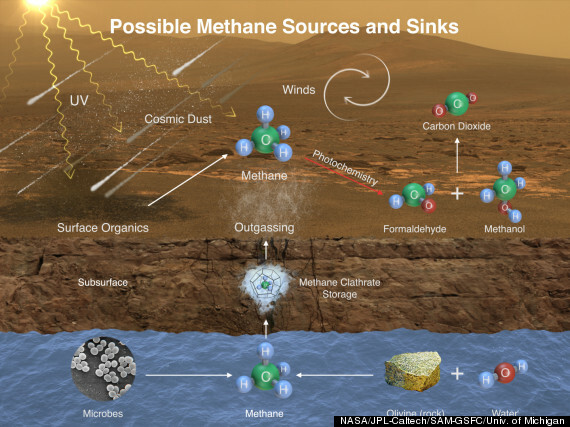 NASA’s Curiosity rover detected a strange burst of methane gas in the atmosphere on Mars, along with other organic chemicals in rocks on the planet’s surface. These findings are raising new questions about the planet’s habitability today as well as in the past. Using its onboard Sample Analysis at Mars (SAM) laboratory, the rover “sniffed” more than a dozen samples of the Martian atmosphere over a 20-month period. Grotzinger and his team found that methane levels shot up tenfold to an average of seven parts per billion over two months in late 2013 and early 2014, according to NASA. The researchers aren’t sure what caused the burst, but they’ve offered two potential explanations: an interaction between water and rocks called serpentization, or methane-belching microbes. Anaerobic bacteria produce around 95 percent of the methane on Earth. Curiosity found other organic (carbon-containing) molecules in powder collected from drilling into an ancient rock called Cumberland. The researchers say this is the first definitive evidence of organics found on the surface of Mars. While the presence of organics doesn’t prove that life existed on ancient Mars, it suggests the planet may have had the ingredients required for life. A paper describing the detection of methane was published online on Dec. 16 in the journal Science. New data from NASA’s Curiosity rover indicate the red planet’s Gale Crater once contained a massive lake and that Mount Sharp, the mountain at the center of the 96-mile-wide crater, formed from the build-up of sediment over tens of millions of years. This suggests that Mars may have been a much wetter than previously thought. The new finding suggests that large, long-lasting lakes once dotted the Martian landscape, increasing the possibility that the planet was once habitable. Curiosity collected the new data on its five-mile drive to Mount Sharp, the prime destination on its mission to study Mars’ climate and geography. The rover landed in Gale Crater in August 2012. In March, scientists discovered that the crater contained beds of sandstone that were tilted south toward Mount Sharp. They believed these rocks were deposited by streams that fed into a larger body of water in the center of the crater. After reaching Mount Sharp in September, the rover spent two months studying rocks in the Murray formation at the base of the three-mile-high mountain, discovering fine layers of mudstone–which tend to collect at the bottom of lakes.